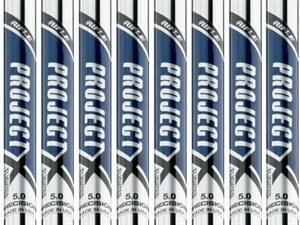 I love these Project X Flighted shafts. You build your set so that each club in the set has a unique kick point. The longer irons have a lower kick point so the ball gets up quick and flies further, while the shorter irons have a higher kick point for a lower, more controlling ball flight. If control is your main objective, you can't do any better than these shafts. Keep in mind, though, this is a premium shaft and you are paying to drive this Ferrari. The shaft is played on the PGA Tour and is also standard in many of Titleist's player sets. I wouldn't recommend these to anyone other than single digit handicappers, unless you have a huge wallet and you are trying to impress your friends. For half the price, you can get True Temper Dynamic Gold shafts -- the number 1 shaft on the tour. Finally Project X has a non-Flighted alternative with the tapered tip. Both irons are slightly softer than the True Temper Standard irons with a more satisfying feel -- unless you go to the True Temper Dynalite SL (20% lighter) or the True Temper GS 75 (the same weight as graphite).